Cellular proteins that are hijacked by HIV in order to complete its replication cycle, form attractive new targets for antiretroviral therapy. In particular, the protein-protein interactions between these cellular proteins (cofactors) and viral proteins are of great interest to develop new therapies. Research efforts have led to the validation of different cofactors and some successes in therapeutic applications. Maraviroc, the first cofactor inhibitor approved for human medicinal use, provided a proof of concept. Furthermore, compounds developed as Integrase-LEDGF/p75 interaction inhibitors (LEDGINs) have advanced to early clinical trials. Other compounds targeting cofactors and cofactor-viral protein interactions are currently under development. Likewise, interactions between cellular restriction factors and their counteracting HIV protein might serve as interesting targets in order to impair HIV replication. In this respect, compounds targeting the Vif-APOBEC3G interaction have been described. In this review, we focus on compounds targeting the Integrase- LEDGF/p75 interaction, the Tat-P-TEFb interaction and the Vif-APOBEC3G interaction. Additionally we give an overview of currently discovered compounds presumably targeting cellular cofactor-HIV protein interactions. 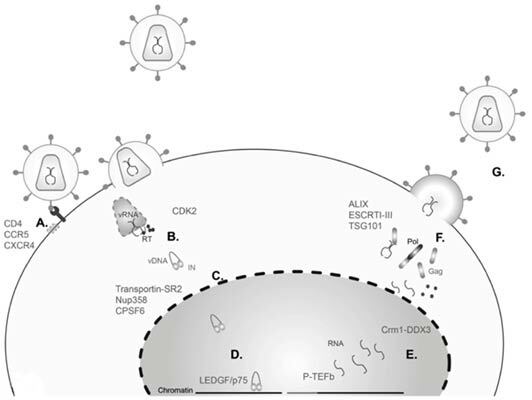 HIV, Cofactors, APOBEC3G, Antivirals, LEDGF/p75, LEDGIN, P-TEFb. Laboratory for Molecular Virology and Gene Therapy, Department for Pharmaceutical and Pharmacological Sciences, KU Leuven, Kapucijnenvoer 33 VCTB+5, Leuven, Flanders, Belgium.